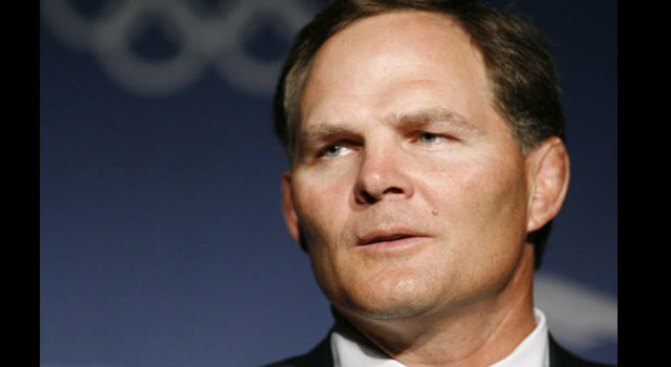 DENVER -- Jim Scherr has stepped down as the chief executive officer of the U.S. Olympic Committee, a surprising resignation that comes with the federation facing financial difficulties and in the midst of trying to bring the 2016 Olympics to Chicago. Scherr announced his decision Thursday. His last day will be March 31, and he will be replaced on an interim basis by Stephanie Streeter, a member of the USOC board of directors. On Tuesday, Scherr announced the USOC would trim up to 15 percent of its staff as part of an effort to pare $7.1 million from the 2009 budget and stay ahead of the bad economy. During a news conference that day in Washington, he spoke about the future and gave no signs of his pending resignation. He will leave nearly four years after taking over at the USOC, where he helped the federation streamline a bulky governing structure and regain a reputation that was sullied in the wake of the Salt Lake City Olympics bid scandal. The timing is bizarre. The USOC is moving into the final stages of helping with the bid to bring the 2016 Olympics to Chicago. The SportAccord, an international gathering of sports dignitaries, including those from the International Olympic Committee, is set for later this month in Denver with all four finalists scheduled to present their pitches for the games. And in April, Chicago will host the International Olympic Committee on a final tour of the city in advance of the October decision. "Well, it doesn't help. For sure, it doesn't help," 2016 Chairman and CEO Patrick Ryan said. "But the reality of it is peope come and go." One of the USOC's biggest challenges over the past few years has been to establish a sense of continuity in its organization, so international types will feel more comfortable with leaders of the richest and largest Olympic federation in the world. Scherr was, of course, a key part of that leadership team, but he'll soon be leaving. "Jim guided our organization through a period of unprecedented challenge and change, and did so with an unwavering commitment to enabling America's athletes to succeed on the field of play," USOC chairman Larry Probst said in the news release.